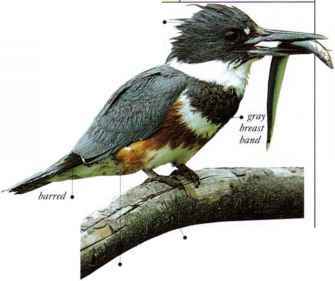 Camouflaged against leaves and undergrowth by its speckled, banded plumage, this is a common waterside bird. It always occurs in places where plant cover borders on open water, whether the sea, a freshwater lake, a marsh, or a pool in wet grassland. This is always a wary bird, although it becomes less timid during its active periods at dusk and by night. By day it tends to stay within thick vegetation. If forced to move, it flies off awkwardly with dangling legs. Some populations fly long distances on migration; others remain in one place all year. In general the diet consists of insects and other invertebrates, small mollusks, seeds, and other parts of plants. • NliST A hollow lined with grass and leaves, concealed in dense vegetation, often some-distance from the waterside. Sulawesi, New (iuinea, Australia, New Zealand, and the W. Pacific Islands. 1 his stout, strong bird is flightless and lives in grassland, scrub, or forest edges, wherever undergrowth or thickets arc plentiful. It is not timid, and is usually seen walking about in a deliberate manner, flicking its tail. If the need arises, it can run fast, and it is a competent swimmer. 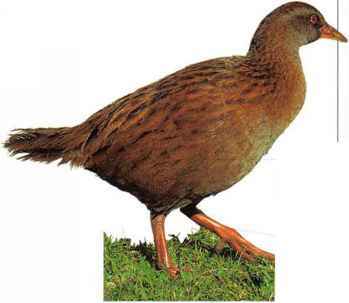 The Weka feeds on the ground, taking a varied diet, including earthworms, rats, small birds, birds' eggs, seeds, and grass shoots. • NEST A shallow cup of sedges and grasses, hidden among herbage or fallen branches. 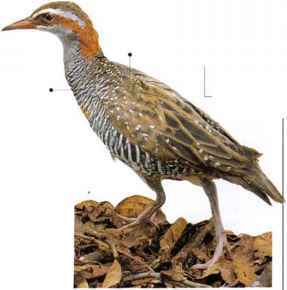 • RKMAKK The Weka is one of a number of island-dwelling rail species that have become flightless. Like most of them, it also became lafRer.